Accessibility is usually a low priority when young families are house-hunting. Good schools, certainly, a modern kitchen—these features top most lists. Homes that are environmentally safe, that reduce the chance of injury, and that accommodate all our interests—these features aren’t even on the radar screen, though they should be! Too often we have gotten used to living in homes that are “good enough.” Accessible homes raise the bar. Wide hallways can seem a luxury of space—or an opportunity to manage with less space. Here a study, library, powder-room and living room all share circulation routes—a path of travel that avoids space-consuming walls and hallways. 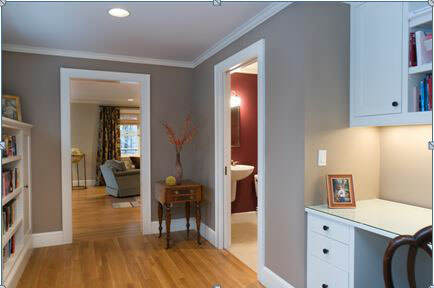 Pocket doors and wide doorways, strategically placed, reduce travel distance. Built-in furniture keeps the path of travel clear and makes the most efficient use of wall space. "On one level, accessible design is common sense. Yet on another, it is truly a revolutionary way of thinking about home design." limitations and other so-called “invisible” disabilities such as cardio-pulmonary disorders. By age 65 disabilities affect one out of every two persons. Whether one has a sports injury or an infirm older relative, a progressive illness or simply the wish to “stay put” in one’s golden years, homeowners are warming up to the idea of home accessibility. The Americans with Disabilities Act of 1991 changed the ways public buildings are designed, and these changes are making their way into the home. A generation of architects and builders, as well as disability-rights advocates and policy planners, are awakening to the possibilities created by an accessible environment—greater participation in community life, at all levels. State and local building codes now mandate accessible public spaces, but for single-family houses, it is usually the unique requirements of those who live there that set the standards. Private homes are the laboratories for residential accessibility, as people with disabilities collaborate with medical and design professionals to find ways to make everyday life easier. For a parent who is hard of hearing, removing walls and adding glass doors lets her keep track of children in the next room. For someone who is blind, storage cabinets throughout the house mean that supplies—at the entrance, stair landings, toilet—put essential items where they are needed. Accessible design is creative design, tailored to the unique needs of those who live there. 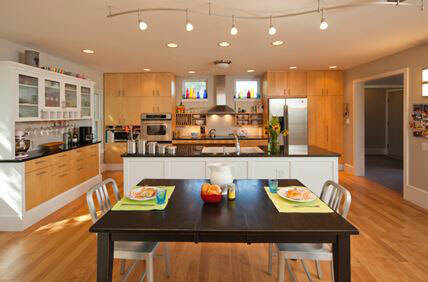 This kitchen-dining area design is a roadmap for the activities of preparing and eating meals. Groceries are brought in from the door at the right, and stored in the fridge and pantry. A central work island doubles as a serving counter to the dining area. Appliances—cooktop, wall ovens, microwave, sink, dishwasher, and fridge—are all close by, a short spin in a wheelchair. For a standing cook, spatial proximity means less physical strain and more efficient kitchen activities. Hallmarks of accessible design are wider doorways and zero-step entrances—useful features, whether using a mobility device or pushing a baby carriage. You also see paddle-type handles replacing knobs at sinks and doors—functional for a person with weak upper body strength or an armload of laundry. These are the kinds of details that have come to be known as “universal design” (or “inclusive design”). Universal design represents an approach to creating things that can be used by everyone, everywhere. It is a movement as well as a philosophy of design, one that homeowners, realtors, builders, architects and designers are starting to embrace. Big sunny rooms with generous vistas to the outdoors and between activity centers—these features are appealing to everyone, as well as essential to people with a variety of disabilities, hearing loss and low vision included. Universal design is commonsense design. How many accessibility features can you spot in this photo? The wall-mounted sink leaves knee space below, with pipes shrouded to protect the legs of a wheelchair user. Paddle-type faucet handles are easier to use for a person unable to twist knobs. A low tiled shelf behind the sink puts storage within reach. The tilting mirror adjusts for easy viewing while standing or seated. 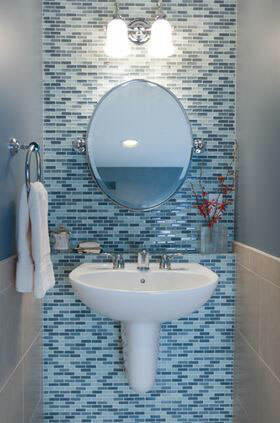 Tiled walls are durable and low-maintenance. Walls painted a medium-blue contrast with light switches and outlets for better visibility. And wall sconces mean changing lightbulbs doesn’t require balancing on a ladder in the middle of the room. If you’re still wondering if accessible or universal design is right for you, consider these questions. Do you have older relatives? Do you know someone who’s been ill or injured? Do they ever visit you? Even if full compliance seems a distant vision, partial access is within reach. “Visitability” statutes are starting to crop up in neighborhoods around the country, requiring zero-step entrances, accessible half-bathrooms, and a wide-enough path of travel connecting activity areas at the first floor. Visitable design is considerate design. The idea of “adaptability” addresses a valuable middle-ground in the design of homes, somewhere between full accessibility and the typical barrier-filled residence. Putting a kitchen or vanity cabinet on casters allows it to be rolled aside for a homeowner who needs to sit while cooking or washing up in the bathroom. Installing solid wood blocking behind a shower wall means sturdy grab-bars can be mounted there later without requiring costly re-tiling. Adaptable design saves money over the long run. The Accessible Home: Designing for All Ages and Abilities, written by me with a foreword by architect Michael Graves, and published by the Taunton Press in October 2012, introduces 35 unique homes, their inhabitants and designers. There are families whose children were born with conditions such as polio, cerebral palsy and spina bifida. There are young parents who use wheelchairs and have children who don’t. There are couples living with progressive illnesses and people injured in skiing or automobile accidents who must discover new ways of doing things. If necessity is the mother of invention, then these conditions have called forth enormous creative energies which shed light on how homes can better serve us all. Accessible homes are not bigger, or even more expensive; they’re just smarter. This accessible mudroom has something for everyone. There is a sturdy non-slip floor level with the porch outside for added safety on wet snowy days, and generous maneuvering space for a child in a wheelchair with/or without a group of friends. Louvered sliding doors keep the room well-ventilated and keep doorways wide within the home. Drawers for boots and backpacks keep the path of travel clear and put storage in easy reach while seated. Low-maintenance beadboard walls take the abuse of sports and mobility equipment. Spending time with the individuals and homes in this book, a new vision of the home arises. It’s much a loft, with fewer doors and walls. Rooms feel larger when there are clear sight-lines linking activity centers. Homes are safer because careful detailing helps prevent accidents. Careful materials selection and skilled construction reduce maintenance. 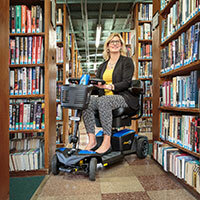 The Accessible Home is essential reading for anyone remodeling or building. Filled with ideas and images, it offers a road map through the process of creating a home that works for those who live in it. Isn’t that, after all, what a home is about?